Calling all pups. 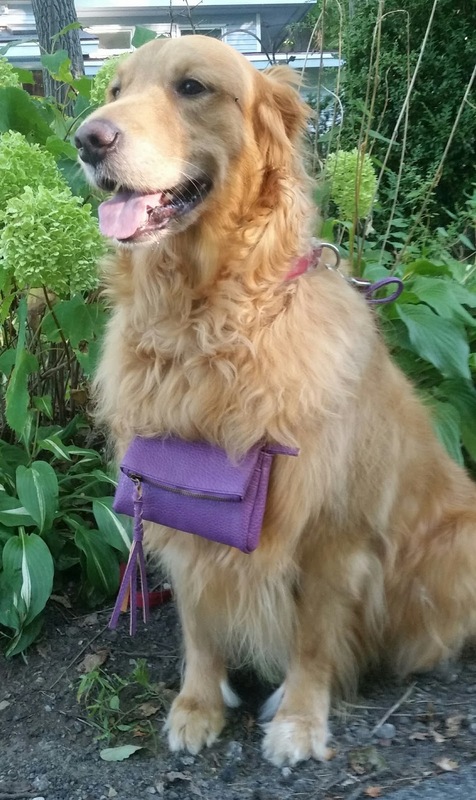 Grab your purple purses (or just your leash and your human) and get ready for the Pooch Parade. It's a fun, family oriented event with adorable pooches, a blessing of the pets, raffles, and even free biscuits. And your pooch will leave the event in style with a new kerchief... and maybe even a pawdicure (only $5 for nail trimming). All the proceeds benefit Wellspring's survivor services and prevention efforts. Wondering what's the connection between pups and a domestic violence agency? You know Wellspring helps individuals and families be safe from abuse. But sometimes we forget that in a home where there's abuse, every family member can be a victim... and that includes our furry, feathered and finned family members. Wellspring has a Safe Pet Partnership that provides temporary foster homes for pets, while their families are in shelter. Then when they find a violence-free home, they can all be reunited. 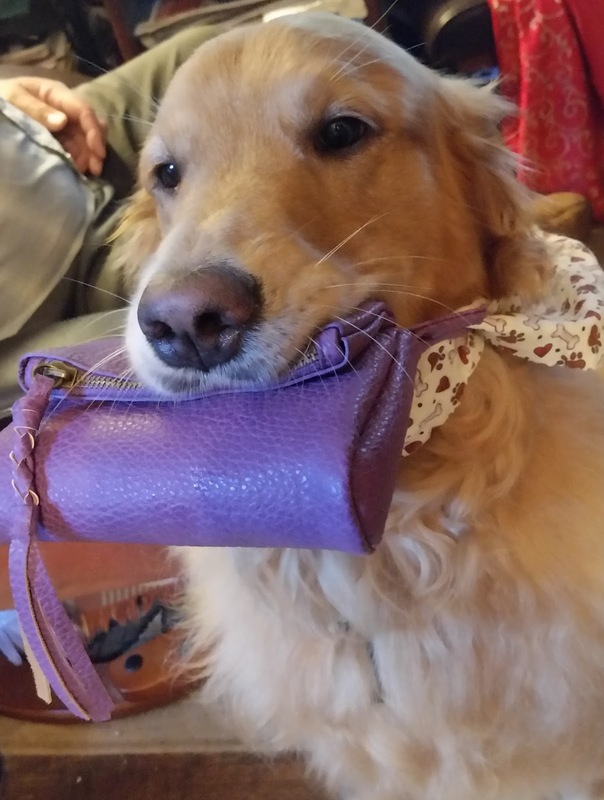 Our friends at Adirondack Veterinary Services, and our event chair Maribeth Wallingford, invite you to join Andy, my dog with a purple purse, at the Pooch Parade. 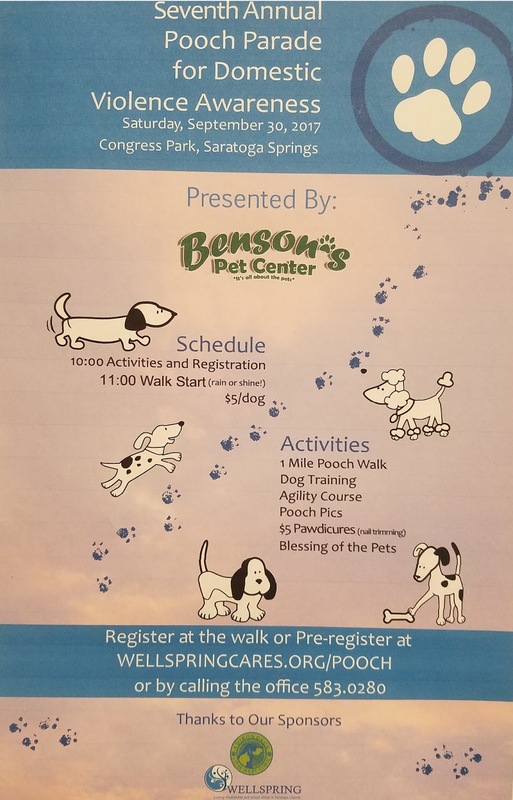 We'll also be recognizing the dogs that work hard helping others, our local K9 dogs and also our friends from Therapy Dogs International. In yesterday's blog, I highlighted 80 women who inspire me every day... well I'm continuing that theme with three more women who are changemakers in our community, in so many ways. leaders. 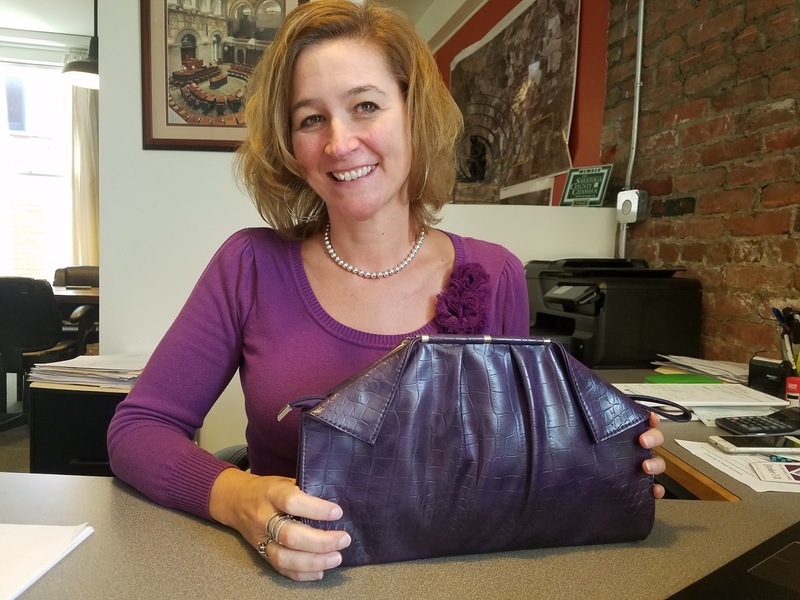 The legacy she created through Leadership Saratoga has transformed our nonprofit community since 1985; the contributions of these dedicated leaders to health human services organizations, the arts, higher education, and public service can't be quantified. Yesterday Linda and I were talking and she started our conversation with the intriguing line, "If I were a betting woman..." and continued with how this related to Wellspring's mission. Wondering what she'd bet on? Click here to find out. Theresa Skaine, a 2006 graduate of Leadership Saratoga, doesn't let a busy life stand in the way of community volunteerism, serving on the Saratoga Hospital Board of Trustees, the Regional YMCA Board of Directors, the Saratoga Springs Senior Center... and she served as the president of Wellspring's board for many years. I recall hearing Theresa speaking on a panel to a group of professional women many years ago and she was asked for her advice on achieving work/life balance. I've never forgotten her answer as it was forthright, totally relatable and channeled the humor and acceptance we all need to balance our lives. I'm paraphrasing, but her secret was to realize that you can't stay on top of everything all the time, but need to make sure nothing slips off the radar for too long. That's advice I can follow. Theresa's breadth and depth of knowledge about Wellspring is evident in her words (click here for her video), "All Wellspring's programs create a community that's better to live in." I've had many delightful and insightful on-air conversations with Jesse Jackson at Look TV. But when the cameras stop rolling, I often linger in the studio chatting with Antoinette Jackson about Wellspring's work and our vision of ending relationship and sexual abuse. Our conversations take deep dives into issues of equality, empowering women and creating social change and peaceable communities. 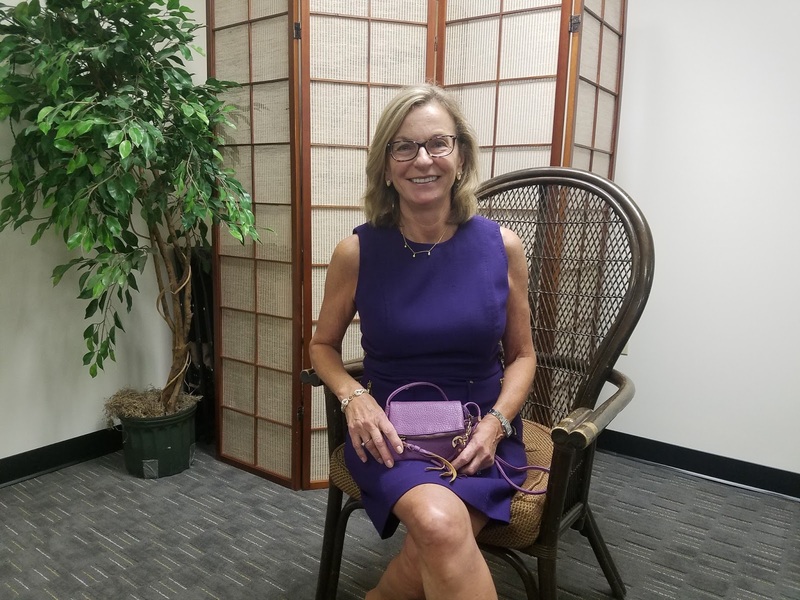 I'm always inspired by her hopefulness about encouraging positive change, "Wellspring offers an array of opportunities for someone who wants to make a change in their life." Click here for more from Antoinette. Many people think of Wellspring as a place you can turn to when in crisis, but you don't need to be in crisis to receive our services, nor do you need to be considering leaving a relationship to work with us. You can call our hotline or make an appointment with an advocate when you need information... or just need to talk. You may not even be sure that what you're experiencing in the relationship is abuse; that's OK, we'll explore that with you. Many people don't think they can access our services unless there's physical abuse, so they 'walk on eggshells' enduring emotional abuse, social isolation, or financial control. In fact, you don't even need to be experiencing abuse yourself. You may be concerned for someone in your life who is an abuse victim- a relative, friend, son or daughter, parent... or employee. With free and confidential services, we can help you better understand how to support your loved one. So don't wait for a crisis; we can help now. Today is my family photo day! These women (and more who aren't in the picture) are all my sisters. It's a big family with more than 80 women. Do we look like sisters? We all look different, tall, short, skin that's fair, freckled, olive or brown, hair that's straight, curly, blonde, red, brown, black and shimmering silver. But we are sisters. Our family name is Soroptimist; the name means Best for Women. If you haven't heard of Soroptimist it's an international women's service organization that's been around since 1921 when a group of women in California were concerned about local issues and wanted to volunteer to improve their communities, but weren't allowed to join the 'male' service organizations. Now the organization has 1,300 clubs in 20 countries with ~100,000 members. Soroptimist Vision: Women and girls have the resources and opportunities to reach their full potential and live their dreams. Soroptimist Mission: Soroptimist improves the lives of women and girls through programs leading to social and economic empowerment. But what makes me proud to be a Soroptimist isn't the numbers -- it's our impact. Our local Club, Soroptimist International of Saratoga County, supports projects locally, nationally and globally that benefit women and girls (providing $45,000 support to organizations annually). Locally we support dozens of programs like Shelters of Saratoga, CAPTAIN, Camp Abilities, Girls on the Run, To Life!... and more. 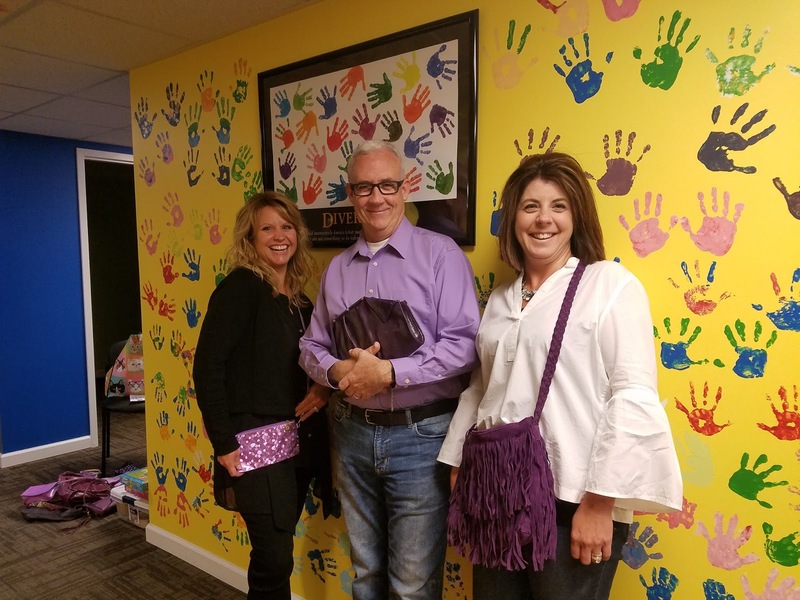 By working with and providing financial support to other caring organizations like the Giving Circle and To Love a Child, we also have an impact far from Saratoga County. Globally we've established birthing centers in Uganda, mobile medical units in Ecuador, we've drilled wells in third world communities without water and installed sanitation in a disaster ravaged area in Haiti... and more. We don't just send funds to support those efforts. We also have Soroptimist members who travel there, volunteer, talk to the people about what their needs are, and keep up the relationships year after year. And of course there's our signature service project, Project Hope and Power, an eight week financial literacy program to help women become more financially self-sufficient. Now in its 13th year, the program has assisted about 700 women to achieve a better life for themselves and their children. Our Soroptimist members volunteer more than 400 hours each year to the program. 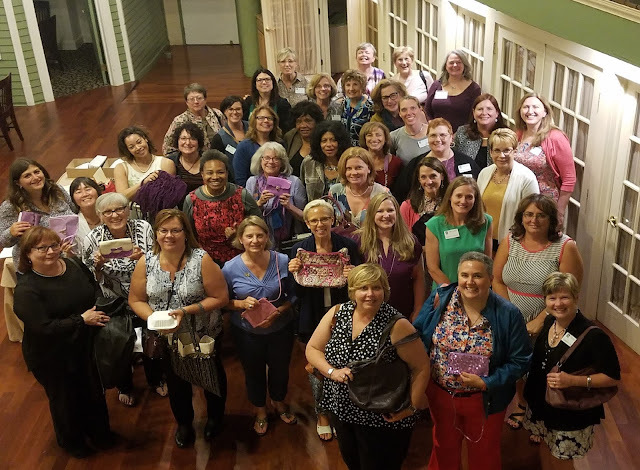 So many participants note that it's the inspiring Soroptimist class facilitators they see each week that gives them the confidence and inspiration to achieve their goals. Here's the feedback from just a few of the 700 women who have participated in the program; it's heartwarming to hear that the program has helped them with increasing their financial knowledgeable, finding independence... and more. What I most like about the Soroptimist vision is that by helping a woman your impact doesn't end there. It ripples to her children, her community, and to the generations that follow. That's a powerful "and more". 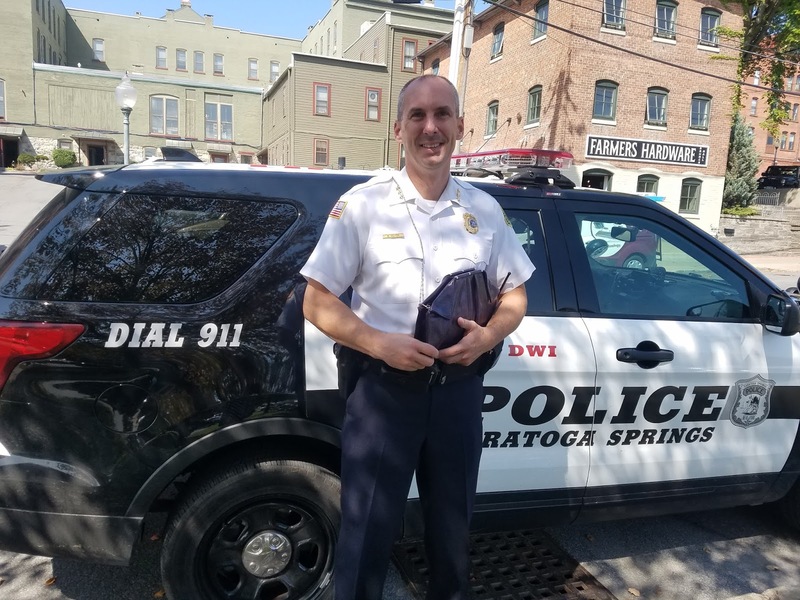 Saratoga Springs Police Chief Greg Veitch sees the prevalence of domestic violence every day, Domestic violence is one of the most difficult calls a police officer responds to ... and one of the most dangerous." Click here for more from Chief Veitch. The SSPD shares Wellspring's goal to end relationship and sexual abuse in our community. In fact we've had an innovative collaboration for the past four years; Wellspring has an advocate co-located at the police department who follows up with victims after a domestic incident, offering support, information and resources. The survivors we call are often surprised at the services Wellspring offers and may take advantage of services beyond legal advocacy, such as our housing or financial literacy programs. And the daily interaction between Wellspring and the SSPD has deepened our collaboration, our understanding of the obstacles survivors face, and commitment to best practices to help survivors and educe future victimization. Assemblywoman Carrie Woerner has long been a champion for healthy families and safe children. Click here as she provides stats and insights on the prevalence of domestic violence in our community... and an inspiring call to action,"We've got to turn this around." She's right and working together we can do it! Folks often ask me if our local nonprofits ever work together -- yes, every single day! We all have limited resources so we are very aware of what supports other agencies offer and regularly collaborate to provide the best client response most cost effectively. Today I was at the Saratoga Center for the Family, working with the staff of the Harriet West Child Advocacy Center. You can't walk into their building without smiling at what a kid-friendly vibe they have. The bright colors are uplifting, which is important as they deal with really serious issues of child abuse, "helping children and families with coping, healing and moving forward." Click here for more about how we work together... but more importantly look at all the small handprints on the wall behind the staff. Those prints aren't just decorations; kids who've been helped at the CAC get to pick a place on their walls and leave their mark-- not only on the wall, but on the hearts of the staff who see every day the magnitude of child abuse in our community and help each child to transcend these experiences and have a bright, safe tomorrow. 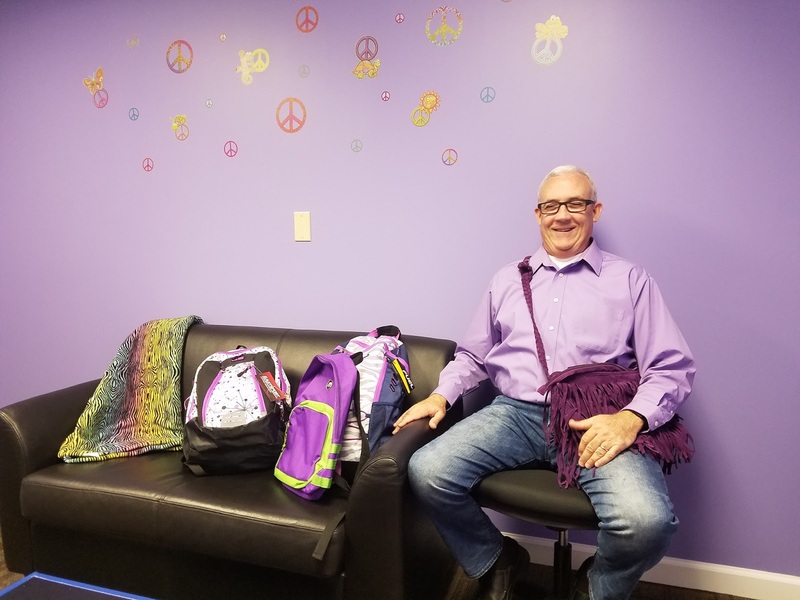 Most people know about the basic needs assistance Wellspring provides for families, including, clothing, emergency shelter, subsidized housing, and food assistance -- these services help both adults and children. However,there are a number of smaller programs that rarely get the spotlight. Two of these programs are our summer camperships and school supply assistance programs. These programs allow the children in families that are transitioning from homes with domestic violence to be kids doing normal kid things like playing with friends at summer camp or starting school off on the right foot (even if that first day you're in a new school where you'll need to make all new friends). While these services provide normalcy for kids during a period of transition, they also reduce stress for the parent that has just left the abuse, giving her/him time to focus on things that may be difficult to do while juggling childcare, like job searches, court dates, and looking for an apartment. I started off today chatting with two folks whose commitment to their fellow human beings is unwavering and inspirational, Mark Bertrand and Robin Dalton. Bright and early this morning they were organizing the Giving Circle's collection of items to help hurricane victims. It seems that whenever there's a need, in Saratoga, nationally or globally, the Giving Circle is doing what they can to help. 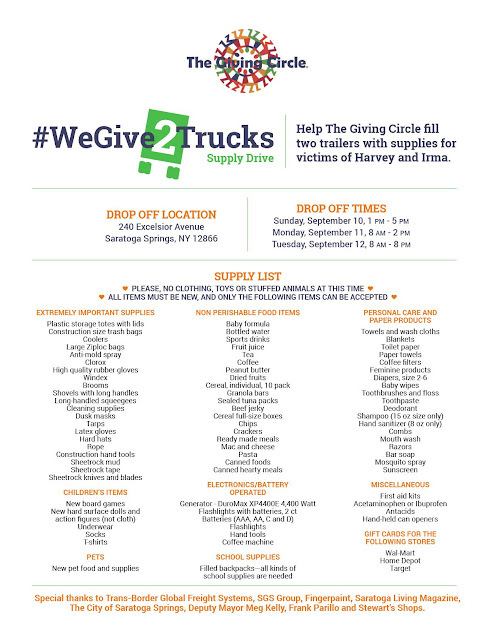 Today and tomorrow they're continuing to collect items to send 2 trucks of basic needs assistance to folks whose homes, lives and supports have been decimated by these natural disasters. I feel blessed to go home to my family and my modest home... and can't imagine what it's like to see a whole community ravaged by a hurricane. My small gift card by itself isn't much, perhaps only enough for a couple of sheets of plywood to repair a tiny section of a roof, but together our impact can be significant. Want to help? Here's what they need... and below hear what Robin and I talked about. Robin made my day a few a couple of months after our Changemakers fundraiser last year. At that event we condensed several of our prevention ed programs into 90 second snippets to show participants what we cover in the programs (not an easy feat to take a 1-2 hour program and shrink it to 90 seconds!) She said that a few weeks after the event, she'd been watching the HBO series Big Little Lies and suddenly what she'd learned at our tabling exercise came back to her and she had a much better understanding of the challenges faced by a domestic violence survivor.. and the more she's learned about relationship abuse, the more she's attuned to subtle cures and how to be supportive, "when someone is leaving abuse, there can be so few options... we need to look to our friends and our community for support." 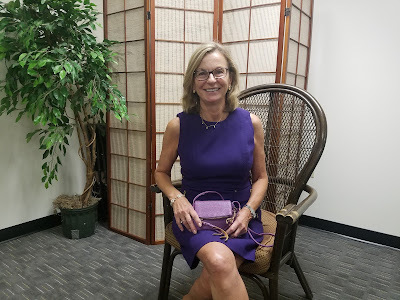 Robin's words inspired me to do more outreach, because I saw that just 90 seconds can make a difference; click here for more of what she had to say. We had a fun time talking about Big Little Lies. The women in our group said we need more opportunities like this to talk about relationship abuse... well we've got just that. On Sunday October 15th at 4 pm, Northshire Books is having a community book discussion about the Big Little Lies. So whether you've read the book or watched the TV series, join us for a spirited discussion. Together we can end relationship and sexual abuse... and that starts with increased awareness. John Kelly has been a respected advocate for youth throughout his career. From his start as a police officer with the Saratoga Springs Police Department (and his work with thousands of youth through the DARE program and as a school resource officer) to his leadership of the National Center for Missing and Exploited Children, his work with the Saratoga County Center for the Family, and now his leadership on launching a coordinated community response to trafficking here in Saratoga County. Yes, trafficking...yes, in Saratoga County! When most of us think of trafficking we don't think of this community. We imagine exploitation that happens in another country, or else vulnerable youth brought across the border and trafficked in a large city, but trafficking in a predominantly suburban county- not what we think of. It happens--more often than anyone realizes... including those of us who work in the field. Through the Safe Harbour program, now in its 3rd year, daily we're identifying more youth who are being trafficked or are at risk of being trafficked...in our community. 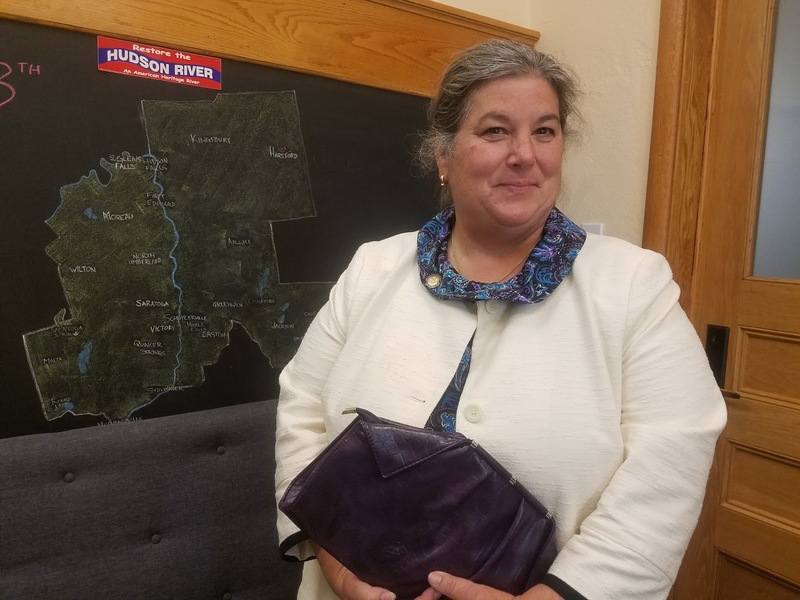 Since July 2016, right here in Saratoga County, the Safe Harbour Team has identified 13 trafficking victims and another 62 individuals under the age of 21 who scored a "high risk" on the trafficking screening tool. And that's just youth. As John says, "it's important for us all to pay attention to the warning signs and to acknowledge it does happen." Click here to hear more from John about youth trafficking. Interested in learning more about trafficking? Click here for a fact sheet on the different types of trafficking. For nearly 40 years, Wellspring has been committed to helping survivors of relationship abuse (domestic violence) and sexual assault. What started to provide basic shelter and crisis services today has a vision of ending relationship and sexual abuse in our community. Wellspring offers a full range of emergency, shelter, and community services, none of which are influenced in any manner in regards to age, race, creed, color, national origin, marital status, gender, religion, sexual orientation, gender identity or expression, military status, genetic predisposition or carrier status, disability, or any other protected class. All of our services and free and confidential.